You don't have to be an artist or a photographer to enjoy your stay with us. Partners of our painting and photography clients who don't want to do either are nonetheless very welcome; furthermore they are eligible for a 30% discount on their holiday cost! So what is there for such guests to do? Well, you could stay at the house and enjoy the pool and facilities, like the Petanque (Boules) court. If you enjoy making music, we have a guitar and an electronic keyboard you can borrow. BUT, there is also much to see in the area, and you can see a good deal of it under your own steam. The canal lies just 700 metres from our back door. Reliable and economic car hire is also available in Marmande (16 kms away). Also, just a couple of kilometres or so away is a nature reserve (visits by appointment only). 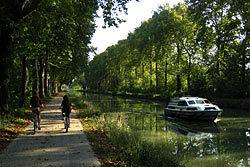 You could hire a boat or canoe for a while or, if you like fishing, why not have a quiet, restful day trying for some carp in the canal or La Garonne. We'll even lend you a rod and line! Last but not least, you could go out for one or more days (as many as you like in fact!) with either the painting or photography group and see the lovely landscapes, towns and villages. It's especially important not to miss the fantastic water-lily gardens of Latour-Marliac at Temple-sur-Lot from where Claude Monet purchased all the plants for his garden at Giverny. 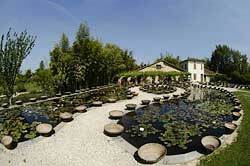 The gardens contain a lake, tropical house, waterfall, and the French National Collection of water lilies. Lunches are not included for non-participating guests. A small charge of 8 euros is made for a substantial picnic lunch (which needs to be ordered the night before). 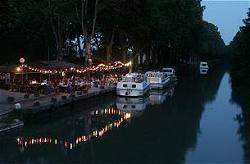 Food is also available at the "Halte Nautique" on the banks of the canal, just a few minutes walk from the house.